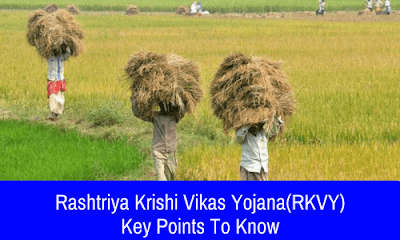 What is Rashtriya Krishi Vikas Yojana(RKVY)? It is also known as 'National Agriculture Development Scheme'. RKVY was launched as a part of the 11th Five Year Plan by the Government of India. To help State Governments so as to increase investment in agriculture and its allied sectors. To make sure that the local needs and crops should be priorities and reflected in the agriculture plans of the States. By the decentralising decision-making power and by providing flexibility and autonomy to States in the process of planning and executing agriculture and related sectors schemes. By ensuring the preparation of Agriculture Plans for Districts and States based on climatic conditions, availability of technology and natural resources. To significantly increase the productivity of Agriculture and its allied sectors and eventually maximise the returns of farmers in agriculture and its allied sectors. Under RKVY, a state is eligible if it maintains or increases its amount of expenditure on its agriculture and allied sectors with respect to the total State Plan Expenditure. Where the Base Line for this expenditure is the average of the percentage of expenditure incurred by a State Government for the previous three years on Agriculture and its Allied Sectors minus any funds related to Agriculture and its allied sectors that it may already have received in that time under its State Plan. Bringing Green Revolution to Eastern Region: This programme was initiated in 2010-11 targeting the improvement in the rice based cropping system of Assam, West Bengal, Orissa, Bihar, Jharkhand, Eastern Uttar Pradesh and Chhattisgarh. Initiative on Vegetable Clusters: Growing demand for vegetables was proposed to be met by a robust increase in the productivity and market linkage. For the purpose, an efficient supply chain needed to be established, to provide quality vegetables at competitive prices. National Mission for Protein Supplements: National Mission for Protein Supplements was launched with an allocation of Rs.300 crore during 2011-12 to take up activities to promote animal based protein production through livestock development, dairy farming, piggery, goat rearing and fisheries in selected blocks. Saffron Mission: The Scheme was initiated in 2010-11 with an overall Government of India budgetary support of Rs.288.06 crore over four years. The mission was meant to bring economic revival of J&K Saffron. Vidharbha Intensive Irrigation Development Programme: The Scheme was initiated in 2012-13 which seeks to bring in more farming areas under protective irrigation. Crop Diversification: The original Green Revolution States have the problem of stagnating yields and over-exploitation of water resources. The answer lies in crop diversification. An amount of Rs.500.00 Crore was allocated for 2013-2014 to the start a programme of crop diversification that would promote technological innovation and encourage farmers to choose crop alternatives.